“Where do all maikos live? 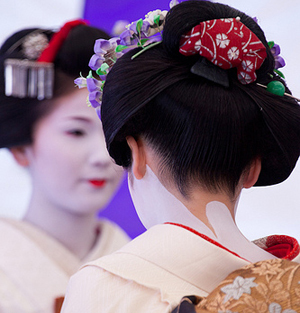 Where can we meet maiko?” People often ask us this question. 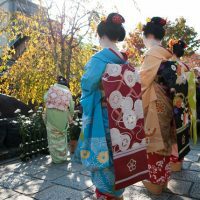 There are places called ‘five flower towns’ in Kyoto ? 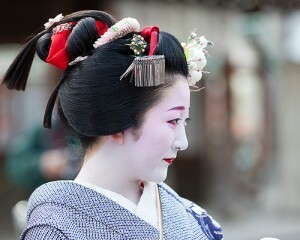 Kamishichiken, Gion-Kobu, Gionhigashi, Ponto-cho and Miyagawa-cho. 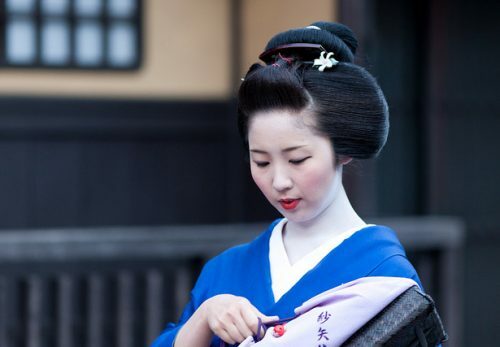 These are the very towns that maiko and geiko live, and it is known as ‘gokagai’ in Japan. Each town has its unique elegance, but there is an atmosphere all over that makes you feel as if one had been transported through time to good old days. It is quietly beautiful but a commanding tension is created in the air. This could be an expression of people’s strength that is imperturbable. Because the towns have inherited and preserved its tradition and custom from generation to generation, and people grew with them, so it can be said that they acquired a mind which is so special from others. 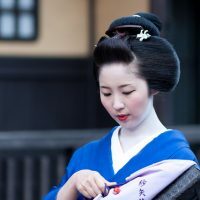 And maiko and geiko living there today can be explained not only as symbols and representatives of Kyoto, but also the successors of the Japanese virtue. In the Muromachi period, when Kitano temnan-gu Shrine suffered from a fire, people took over surplus timber used in the restoration work of it, used them to build seven ochayas. This was the beginning as a flower town and it was called ‘Shichigen-chaya’ (literally means seven ochayas) in those days. 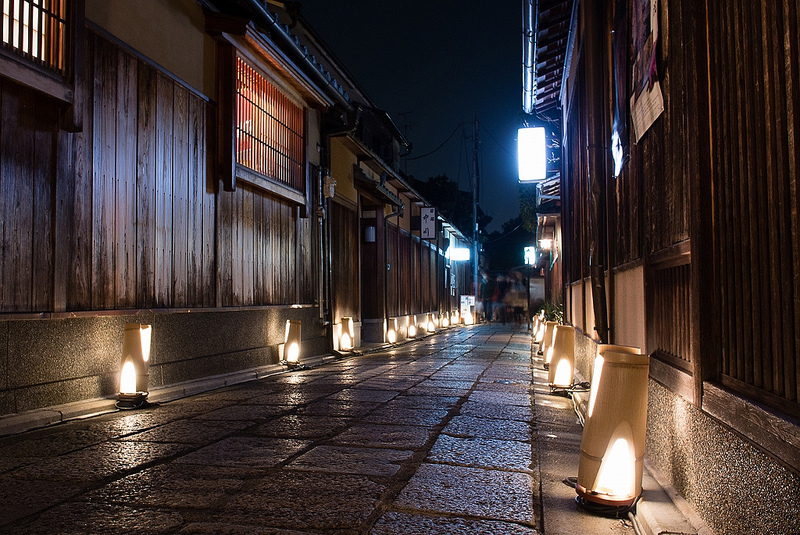 It is located in an area at some little distance from the others, is known as the oldest among five towns in Kyoto. ※Today, ochaya means a place where ozashi is held. In olden days, it used to be a tea-house where teas were served. There were many of them in precincts of shrines and temples, or roadsides. 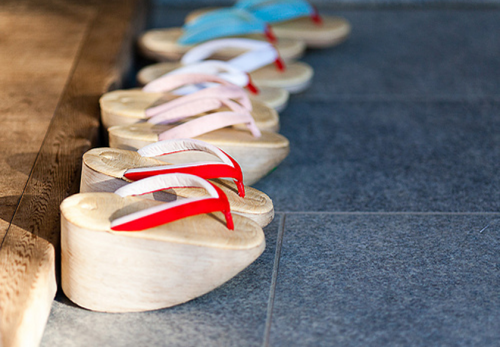 It is said that pilgrims and travelers visiting Kyoto were familiar with them. One of the most prestigious and the greatest man in history, Taiko Hideyoshi (Toyotomi Hideyoshi) held a big tea party in town. ※Mitarashi dango are kinds of Japanese sweets. They usually come in three or five stuck on a stick. Each rice dumpling is coated with a unique soy-and – sugar syrup. Gion-Kobu is a ‘monzen-machi’ crowded with visitors and worshippers for Yasaka-jinja Shrine. It is the largest among five flower towns. This beautiful town was used as subject matters for novels, set for kabuki many times, and because of that, many people think of it when they hear something about ‘hanamachi.’ I would say that it has the highest popularity not only in Kyoto, but also within Japan. The town has also become well known for Ichiriki-jyaya (one of the most prestigious ochayas) which was used as a location for TV drama, ‘Genroku-ryoran’in Japan. ※Monzen-machi is a town which was formed around powerful shrines and temples. Speaking of the crest of Gion-Kobu, it goes back to 1851. It used to have a white letter ‘Gi’ of ‘Gion’ in middle of one big circle formed by eight little circles joined by a line. Initially, there were initial letters of eight small towns in the district drawn in each little circle. 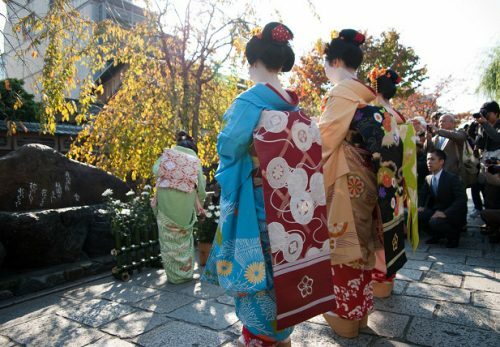 When the Meiji period came, Gion was divided into two parts-Kou and Otsu. Then, ‘Gi’ has been replaced by the word ‘Kou’, to the present. 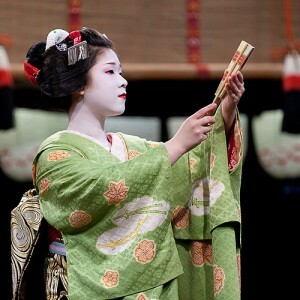 Although it is a town with least number of maiko among five flower towns today, there is the Gion-kaikan Theater where maiko and geiko of this town show their splendid performances. It is the rare classic place where you could enjoy the Showa amusement which hardly exists today. In the Showa period, it was originally used as a movie theater where you could enter or exit freely, enjoy two films a day for a ticket and are allowed to bring in all sorts of food and drinks. Regretfully, they finished showing movies on 30th of March this year. Today it is mainly used as a performing place for comedians except for a period of the Gion Odori. 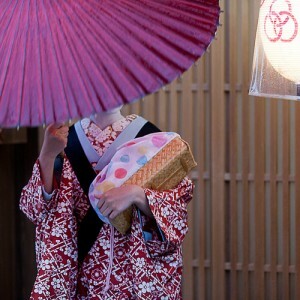 （now it’s called the Yoshimoto Gion Kagetsu.）It has become a town where tradition and contemporary meet and collaborate. The crest of Gionhigashi is identical with the one of Gion-Kobu, except the fact that there is no letter written in a middle of a circle formed by eight little circles linked by one line. In 1881, when the town of Gion was divided in two, it has become the current type (there was a letter till then) and ochaya association of Gionhigashi was formed in 1955.
its name comes from Portuguese word ‘ponto’ meaning the edge. They say the town has been prospered naturally from inns and chaya (same the meaning as ochaya) for the people who shipped on Takase-bune(ship) passed by Takase-gawa River. The lovely plover is drawn as a crest of Ponto-cho. 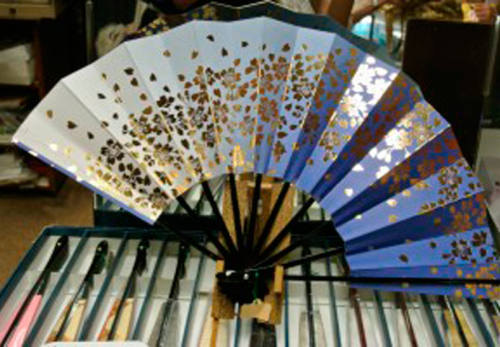 It was originally created in 1872 when the Kamogawa Odori (the Kamogawa Festival) was first held. Plover is one of common features in winter, which flies over Kamogawa River. 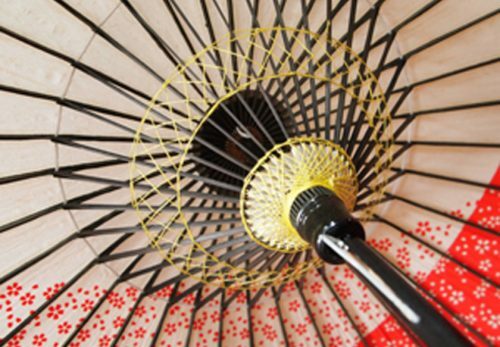 It is a Kyoto crest with poetic sentiment that enriches our minds. It is said that Miyagawa-cho has been prospered with a strong link with plays. There was a time when various theaters started to be clustered in this area. They include a famous kabuki theater, Izumo no Okuni. Because of that, number of accommodations for customers and actors naturally increased little by little. This is said to be origin of Miyagawa-cho as a flower town. The crest of this town is ‘three rings’. There are several theories about motif ? when Nyokoba (educational institution for geiko) started to be managed by Kyoto prefecture, ‘shrines and temples’, ‘machiya’ and ‘flower town’ joined as school facilities. Theory number one is that it was a memory for those three to be united. Number two is based on a historical fact. There are three mikoshis (portable shrines) enshrined in Yasaka-jinja Shrine. They say three rings symbolize them. The crest has been used since the Meiji period.